English students love our video lessons, and we love making them. We are delighted that you like our video lessons, and we are grateful for all the positive feedback we receive from you. We make sure that you get all the essential information as well as many meaningful examples on the topic of study. Most lessons also include a practice activity that deepens your understanding and active use of the language point. We present the content in simple English, and we speak clearly so the explanations are easy to follow. We use extensive animations, colour coding, and visual cues to clarify concepts for you. This greatly enhances your understanding of the topic and helps you to easily remember the examples when you want to use them in your own writing or speech. To give you an idea of how much we care about the quality of our video lessons, we spend an average of 20 hours to produce one video lesson for you. 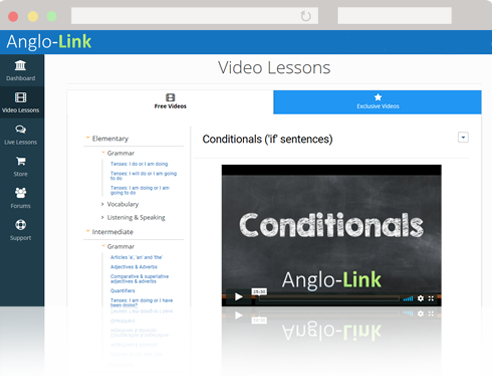 Our grammar video lessons are voice-recorded and animated versions of our written explanations. They offer additional examples and exercises to deepen your understanding of the grammar topic. These videos review and expand on the contents of pronunciation and conversation lessons. Their aim is to help you to fully assimilate the material and to continue to improve your English listening skills and your pronunciation. Some of them include dictation exercises that help you with your spelling and writing skills too. These videos give you tips on how to study different areas of the English language effectively and how to improve different skills. These English videos provide follow-up lessons and additional exercises on the more challenging topics in every category (grammar, pronunciation, and vocabulary). These video lessons are exclusive to Silver and Gold study plans.